First, this article is not meant to be yet another smartphone bashing. Much. 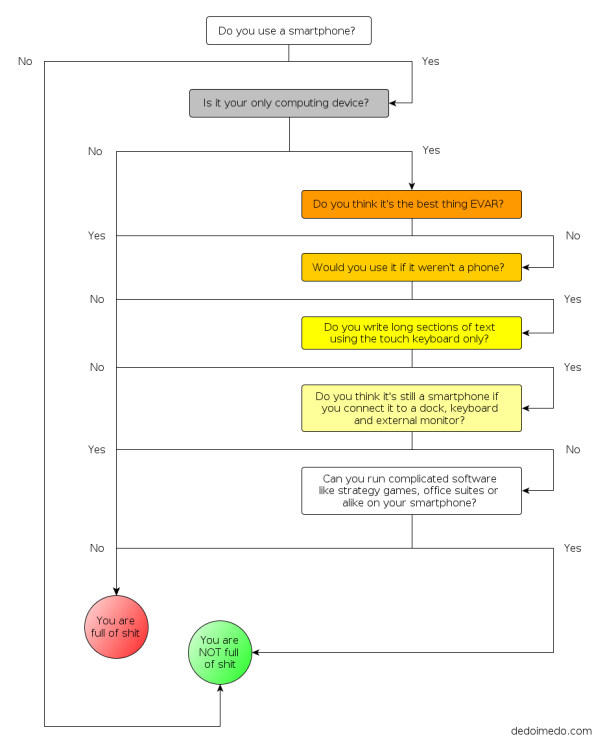 This article is a simple and honest attempt to evaluate your smartphone usage in an objective manner, with a delightful flowchart. The reason I am writing this article is the fact some people say: smartphones are the future. Which is not a bad sentence, but then, they go about how the desktop will die and how everyone will only be using smartphones as their primary computing device. At this point, you come here and read this article, and then glimpse at the smartphone flowchart below, which will tell you exactly how right or wrong you really are. The thing is, while more and more smartphones are being sold, which is not surprising given their primary function as a phone, I have yet to meet one individual who truly and honestly uses only a phone device, no laptop, no desktop, no keyboard and mouse. There you go, you see, super awesomeness! There you go, the marketing analysis demistified and demystified. If you had any doubts before, now you do not, and you know what it's all about. The fact you may have hybrid devices you can take with you and use them in multiple modes of work, akin to today's laptops, does not change the fact most people will not commit their lives to easily lost, stolen or damaged bricks of plastic, compared to what grease-and-work 24/7 desktops offer. The truth will be much like I have outlined before, but regurgitating articles is not as productive in extracting cellulose from the product, so we will end here. Hopefully, this article has provided you with much rejoicing. The other possible outcome is that you are thoroughly dis-amused, which is fine, really. Have fun.